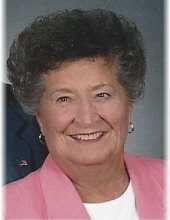 Irene Teresa (Farkas) Farr, 87, of Bowling Green, OH passed away Sunday February 10, 2019, at her residence at Heritage Corner. She was born in Portland Point, New York on August 27, 1931 to Michael and Theresa (Kosa) Farkas. She graduated from Bowling Green High School in 1949. On September 16, 1951, Irene married George Farr, who was stationed at BGSU with the US Air Force. For a time they lived in Cheyenne, Wyoming and Washington D.C. The couple settled back to Bowling Green in 1954 and she worked numerous jobs including Rossford Ordnance and LaSalle’s. Irene and George raised three sons: Michael, Brian and Darrin. After the sons had grown, Irene began working at the Bowling Green State University Jerome Library, retiring in 1993. For many years, Irene and George spent winters in Gulf Shores, Alabama, where they met other couples from Ohio and enjoyed Ohio Club get-togethers. She enjoyed day trips with her sisters, cross stitching, siting at the beach, reading, watching Cleveland Indians baseball and Cleveland Browns football games and going to casinos. Most of all, Irene loved spending time with her family. She was a member of the First United Methodist Church in Bowling Green. She was preceded in death by her parents; son Brian; sisters Yolanda (Lonnie) Dulaney, Elizabeth (Betty) Frank; Margaret Horner; and brother Stephen Farkas. Irene is survived by her husband; sons Michael (Lori), Bowling Green; Darrin (Lori), Hamilton, OH; sister Carol Lashuay, Bowling Green; grandchildren Alicia West (Zack), Beavercreek, OH; Amanda Kiefer (Josh), Bowling Green; Emily Hohler (Nick), Midland, MI; Kelsey Farr, Hamilton, OH; Brianna Farr, Middletown, OH; Tyler Farr, Dayton, OH; Brennen Farr, Hamilton, OH; and seven great-grandchildren Aiden, Eleanor, Adelaide, Jacob, Brody, Wilder and Delaney. Visitation will be held on Tuesday February 12, 2019 from 2:00 to 4:00 p.m. and 6:00 to 8:00 p.m. at Dunn Funeral Home, located in the Historical District of Bowling Green at 408 West Wooster Street. Her Funeral service will be held on Wednesday February 13, 2019 at 11:00 a.m. at the funeral home. Pastor Amy Miller will officiate. Interment will follow at Oak Grove Cemetery, Bowling Green. In lieu of flowers, the family requests memorial donations be made to Bridge Hospice Care Center or First United Methodist Church, Bowling Green. To send flowers or a remembrance gift to the family of Irene T. Farr, please visit our Tribute Store. "Email Address" would like to share the life celebration of Irene T. Farr. Click on the "link" to go to share a favorite memory or leave a condolence message for the family.